On Tuesday, after a long hiatus, the local observatory was, at last, able to open to the public. Between the Snow on Monday theme of this winter, and the tendency to clouds and rain in what New England calls Spring, Ladd had been closed, and sending plaintive and apologetic emails, for weeks. We walked up shortly after the 8:00 PM opening to find long lines, and a crowd as large or larger than the Halloween open house nights, when the staff and students turned the Observatory into a haunted house, neighborhood naughties swiped too much candy, and the roof deck was open for star gazing. Being Tiny Town, the Young Mr’s middle school art teacher was in line ahead of us with her young son and wife. To his credit, he did acknowledge her. 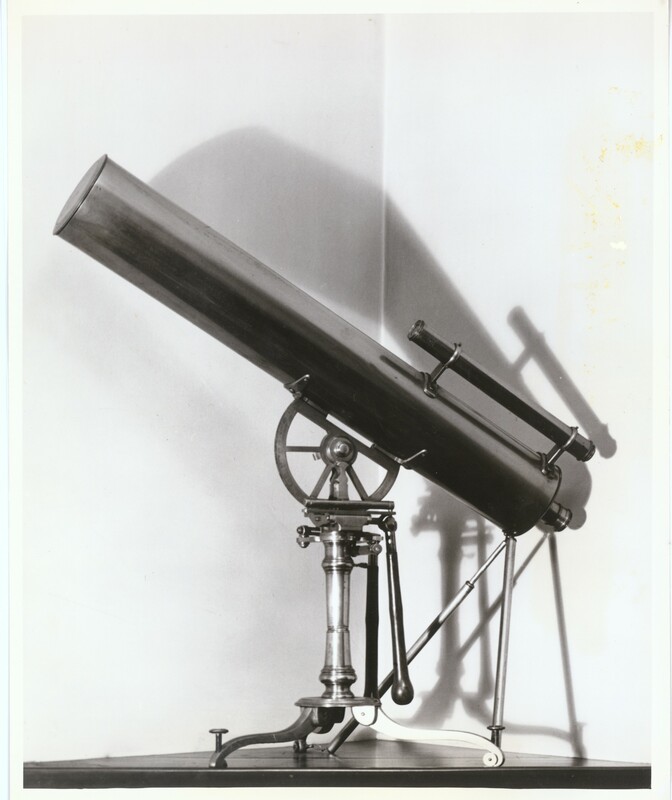 The telescope used by Benjamin West to observe the Transit of Venus, 1769. Brown University image. There’s a long history of astronomical observation here, with a street named Transit for the 1769 Transit of Venus, observed by Benjamin West and other local notables. We were happy to join the queue to look through the much larger telescope to see Jupiter, easily visible now. It is really is a “wow!” moment, cooler even than the packages that make it here from India and astonish me. All that distance, light. How truly awesome the view through a telescope must have been in the 18th century, when we, collectively, knew less about the world and universe. How awesome it is now, to be able to see a world so far away, and to wonder what it is like. 4 years I lived nearby and never knew why it was called Transit St. I always figured it was some reference to a Founding Fathers’ respect for long journeys. But what a journey!